Wabash's Schroeder Career Services Center sponsored a Healthcare networking dinner Monday night in Detchon International Hall. The event, which featured seven alumni and attracted 37 students, is part of a series of career-themed networking dinners funded by a grant from the Lilly Endowment. The alums represented dentists to human resource representatives at Eli Lilly. While billed as part of Career Service’s "Internship Week" programming, the networking event offered an interchange between students and alumni that stretched beyond a search for internships. The importance of this opportunity was not lost on Adam Andrews, a freshman who helped to organize the event. Andrews received practical advice from alumni, such as how to improve his interview skills, but also took advantage of the opportunity to pick the brains of some outstanding Wabash Men in the healthcare field. "We’ve got a guy who started his own company who is also a doctor, and we’ve got the president of an Indiana psychiatric group," Andrews said. "A lot of these guys have made it, and to be able to talk with them, they’ve been in our shoes, and have been where we are. For them to be able to talk with us and for us to be able to learn from them and the experiences that they had is the best person to person contact you can get with alumni." Other students were impressed by the accessibility of the alumni. Freshman Andrew Goodman, biology major with aspirations of attending medical school, was initially a bit overwhelmed by the impressive credentials of many alumni. "I was surprised at how easy it was to communicate with the doctors and healthcare professionals. I was a little intimidated at first, but they really opened up the second that you started to talk to them." The alumni emphasized how excited they were to have an opportunity to be able to give back to the current students. Kip Chase ’03, a human resources representative at Eli Lilly currently working towards his MBA, viewed the event as a way to continue the tradition of Wabash alumni support. "It stems back from my experience as a student. The value and importance of alumni who showed interest in me as a student and an individual, who wanted to talk with me about things that I was interested in and things that I wanted to do with my life and my career. The support that they showed helped me to get where I am today, and so this is a way of me kind of paying it back and mimicking that in a lot of ways." Chase added alumni can also show students how to apply their education outside Wabash. "It’s important to share with Wabash students the true value of the education they are receiving and how it can be applied to the business world." 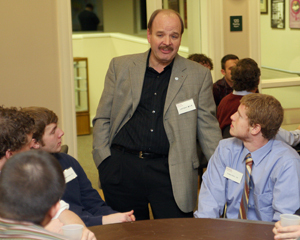 Dr. Randall Williams ’83, a cardiologist who founded Pharos Innovations, a company that monitors patients’ health, encouraged Wabash students to use networking to help tackle big problems. "I couldn’t be doing what I’m doing now had I not had the education that I got here, had I not met the people that I met here, or made the connections through the alumni that I had from Wabash. They helped me see my potential and challenged me to take it to the next level. Learn to look for big problems to solve. Don’t settle for just solving simple problems because you’re a Wabash man, you’ve been trained to think deeply and critically." Although the event offered students a great opportunity to network with alumni, Chase emphasized that these types of events should only be the tip of the iceberg. "Don’t give up. People are meeting tonight and they are shaking hands and exchanging names and possibly cards, but that’s only the cover of the book. The students have to continue to e-mail, communicate, and telephone all these people. Persistence is so important. It’s about being persistent in your efforts to really learn and take part in what the alumni have to offer." The next Career Services networking event will be in Sports and Media. A late February date will be announced soon. 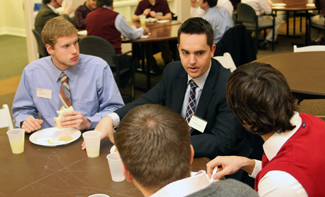 In photos: Top right, Michael Lynch '04 talks about his work with Eli Lilly with students. At lower left, Jeff Fisher '75, a Greenwood dentist, talks about his healthcare career.